Hi everyone, just a quick reminder that if you earned Bonus Day Coupons during August, you only have until today (11:50pm AET) to redeem them. 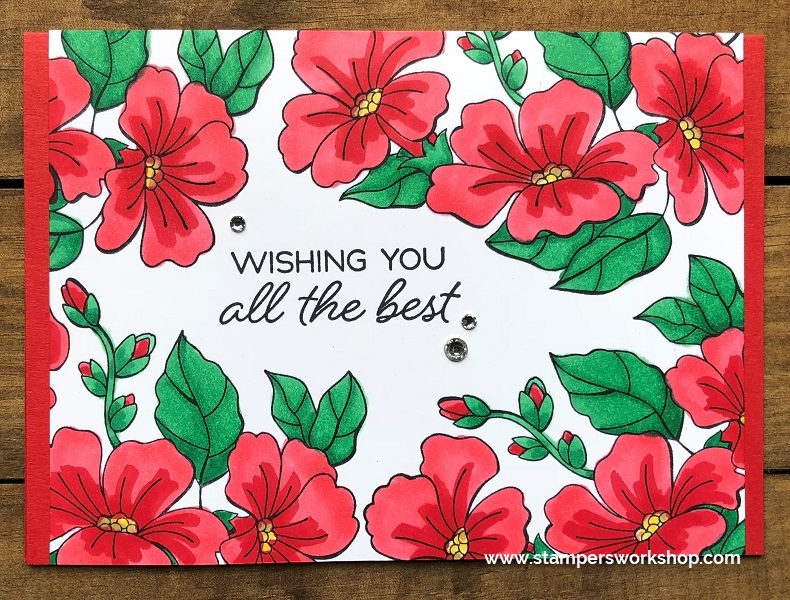 Hi, sadly we are almost at the end of the month which means there is only one day left to secure the Colour Your Seasons Bundle (featuring the Blended Seasons stamp set and the Stitched Seasons Framelits dies – both available separately). Don’t forget the Watercolour Pencils Assortment 2 also goes away at the end of the day. There’s a possibility of the Watercolour Pencils making a return but we don’t know for sure at this stage so please grab them now if you think you might want them in the future. I have three similar cards to share today. They all follow the same design style I’ve been favouring lately but I was experimenting with different colour combinations. I hope you’ll enjoy these cards as well. The above card features a length of Braided Linen Trim (147808) which will be available from 5 September 2018. It’s lovely! 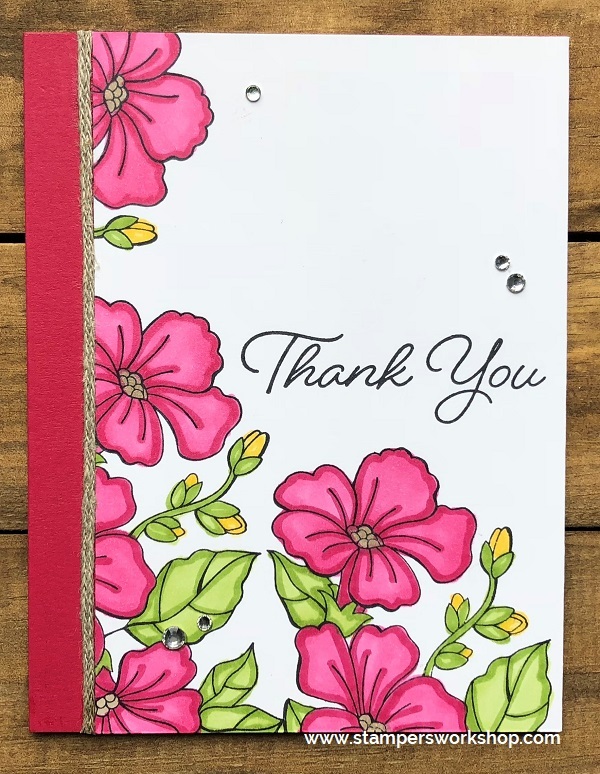 For the next card, I popped up the centre panel with Stampin’ Dimensionals to give a little extra dimension and interest. 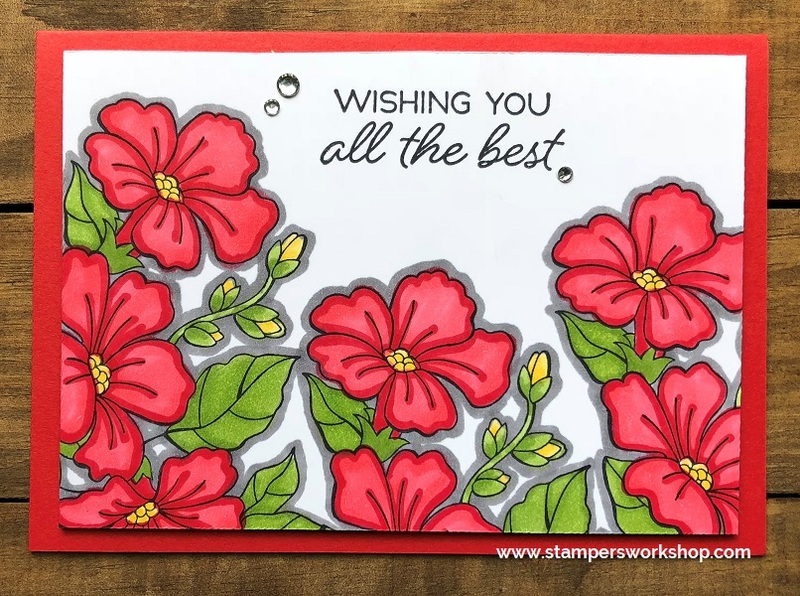 And for the final card I really just wanted to see how the Poppy Parade and Call Me Clover Stampin’ Blends looked together. They look fabulous! Would be great for Christmas too. So here we are at the end. I’m sorry I didn’t get a chance to show you some of the other stamps. I just got completely carried aware with the beauty of the floral image. 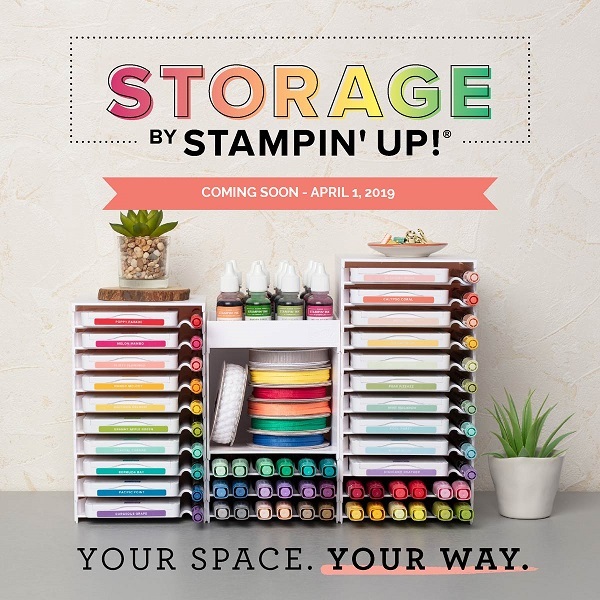 If you are thinking about the Blended Seasons stamp set (or make it a bundle and combine it with the fabulous Stitched Seasons Framelits Dies for a 10% discount), or the Watercolour Pencils Assortment 2, please act now as they will be going today. It’s also the last day of the Bonus Days promotion where every $90 AUD you spend on 1-31 August (before shipping and handling), you’ll receive a $9 AUD Bonus Days coupon code that can be used on 1-30 September 2018. Hi everyone, just a reminder there are only a couple of days left of our Bonus Days promotion. During August for every $90 AUD you spend on 1-31 August (before shipping and handling), you’ll receive a $9 AUD Bonus Days coupon code that can be used on 1-30 September 2018 (and excitingly the new Holiday Catalogue will be released on 5 September! YAY!). Q: Are the coupon codes case sensitive? A: No, but the codes will include a dash. You need to include the dash in the code for them to work. Q: Can you earn multiple codes on a single order? the qualifying amounts to do so. Q: If I earn multiple codes on a single order, will I receive one email or multiple emails with coupon codes? separate codes on three separate orders, you will receive three separate emails. Q: Can I use my coupon codes after 30 September 2018? A: No. All codes will expire after 30 September 2018. Q: If I cancel an order, will the codes be lost? be lost and you will not be able to use them again. Q: Can coupon codes be given away? still only be redeemed once. However, they have to be redeemed in the same country where they are earned. For example, if they are earned in Australia, they have to be redeemed in Australia. Q: Will I be allowed to apply coupons valued at more than the amount of product they’ve ordered? A: Yes, but you will forfeit the overage of the coupons being applied. Q: What if I doesn’t have an email address? 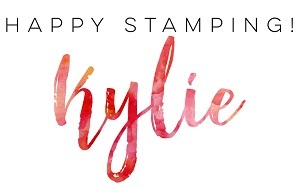 Q: Will my Stampin’ Rewards overage or 50% off items count towards the qualifying sales amount? A: No. 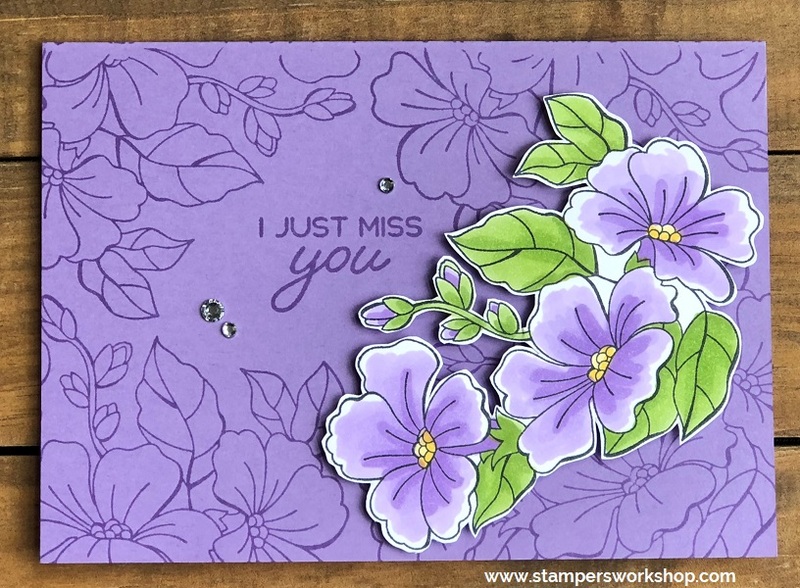 Stampin’ Rewards overage and 50% off items will not count towards the qualifying amount. Q: What if I earn coupon codes but don’t receive an email? A: With so many different email providers, it’s possible that the email may have been sent to a spam folder. Check there first and if the email still can’t be found, contact Demonstrator Support at 1800-SUSTMP (AU) for help.